The three-book series spans twenty years in the lives of Jem and Ella and takes them around the globe, crossing perilous oceans in sailing ships and suffering the hardships many convict and free emigrants suffered to found a British colony on slave labour. Book Two is 'Beneath Strange Stars'. Book Three is 'On Common Ground'. 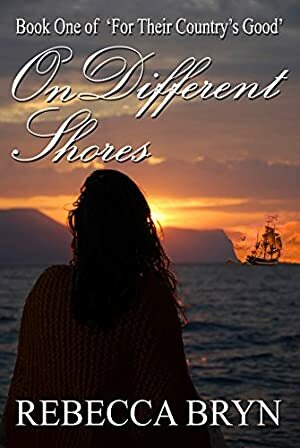 On Different Shores (For Their Country's Good Book 1) by Rebecca Bryn opens in a country rectory in Victorian England, where Ella has been sent after being caught sharing a kiss with her employer's son. Whilst Reverend Buchanan seeks a suitable husband for his dowerless protégé, Ella falls in love with Jem, a poor poacher. Pregnant with Jem's child, she flees her loveless marriage to farmer's son, Harry, and becomes Jem's common-law wife. Jem is found guilty of the manslaughter of a gamekeeper. Lucky to escape hanging, he is transported to Van Diemen's Land for life. Ella refuses to forget him, determined that their child shall know its father. Can Ella raise the money to follow her lover? Will Jem survive the perilous sea journey, manacled in chains? On Different Shores is a powerful, character-driven, story of a young couple and their ill-fated love. Rebecca Bryn has gone a step further than any "Romeo and Juliet" tale by setting it in Victorian times. Women had no rights whatever, but Ella defies convention, earning money any way she can, and giving birth to Jem's son, resolute in her intention to escape Harry. Will she be defeated by Harry's single-minded passion to father a son of his own? If she escapes, can she endure crossing the globe with a toddler? Ella will move readers to tears, and to fury; she lives. All Ms Bryn's characters, the good, the bad, and the ugly, live. On Different Shores is a brilliant historical novel that takes the reader wherever Ella and Jem lead. Track It. This book reaches FREE about 6 times a year. Log In to track Rebecca Bryn on eReaderIQ. to be notified each time the price drops on any book by Rebecca Bryn. to stop tracking Rebecca Bryn. We started tracking this book on April 16, 2017. The price of this book has changed 28 times in the past 735 days. The current price of this book is £1.99 last checked 8 hours ago. The lowest price to date was FREE last reached on March 31, 2019. This book has been FREE 14 times since we started tracking it. The highest price to date was £1.99 last reached on April 2, 2019. This book has been £1.99 15 times since we started tracking it. We last verified the price of this book about 8 hours ago. At that time, the price was £1.99. This price is subject to change. The price displayed on the Amazon.co.uk website at the time of purchase is the price you will pay for this book. Please confirm the price before making any purchases.